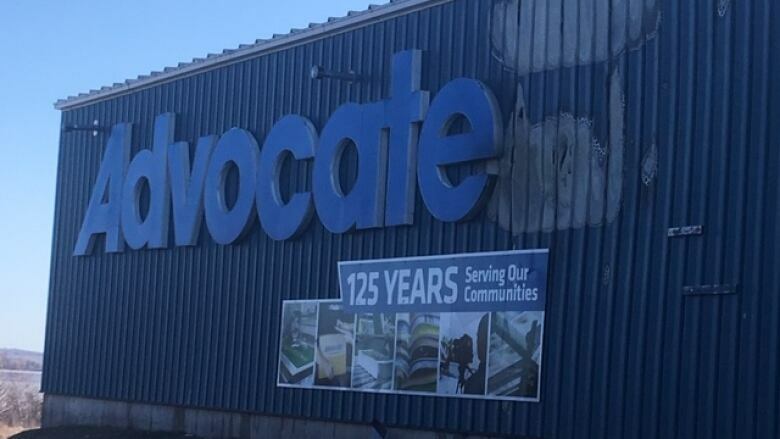 A fire caused some damage at the Advocate plant in Pictou, N.S., but the company says it was largely restricted to a shipping area. A fire at the Advocate printing plant in Pictou, N.S., is out. Firefighters arrived at the scene on Brown's Point Road on Sunday around 12:30 p.m.
"We responded first on the scene and saw smoke coming from the back side of the building," said Paul Janes, the chief of the town's fire department. In an Instagram post on Sunday, Advocate said the fire is believed to have started in, and was mostly contained to, the shipping department. "There was a huge amount of heat, so we had to do what's called vertical ventilate," Janes said. A ladder truck was called in from New Glasgow. "They cut a hole in the roof to allow the hot gases and smoke to evacuate, allowing us to see inside," said Janes. Janes said the bulk of the fire was out fairly quickly — in about 35 minutes — but he said firefighters spent a bit longer putting out hot spots around the building. "And they have 30 or 40 bins full of paper and each one of them had a little piece of the fire," Janes said. "So we ended up having to do a lot of overhaul, making sure things were done right — so we wouldn't be coming back." He said no one was in the building at the time of the fire. He said the building's alarm system didn't activate the 911 system. A bystander made the call. "So luckily someone saw it first and called in because it probably could have been a lot worse than what it was just due to the size and scope of the structure," Janes said. He said he came across the fire while driving past the building before he was paged to the scene.